Warminster Fiberglass offers a wide range of troughs for industrial applications. 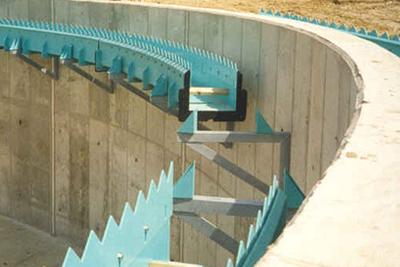 We understand the unique needs of water and wastewater treatment plants with regards to filtration, collection, and flow, and design our troughs accordingly. Our troughs are made from polyester reinforced with fiberglass, enhancing the durability and sturdiness of the material, and offering you a versatile product that you can use for a variety of applications. You can rest assured about the quality and compliance of our troughs. 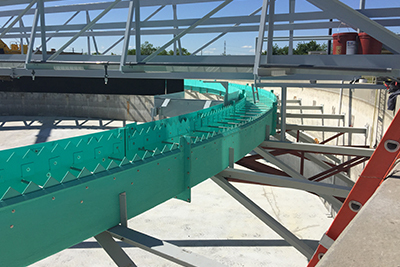 We fabricate all our troughs to ANSI/AWWA F101-96 Standards. 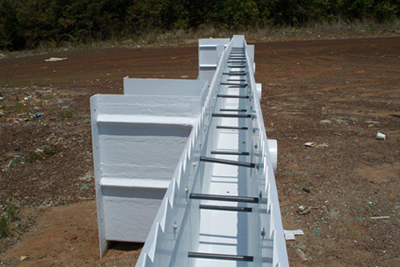 Furthermore, these troughs have been classified by UL and can be conveniently used for components of drinking water systems, which enhances their versatility and range of applications. Our troughs suit a variety of depths and widths, enabling you to use them for any application. The bottoms of the troughs are flat or round. Again, you can select a trough that meets your requirements. For further customization options, we can mold the troughs and manufacture in a circular configuration. This will enable you to mount the troughs against a round tank wall or inboard from the tank wall, if you want to extend or expand your weir footage. In fact, using our troughs, you can double your weir footage, allowing you to use it for multiple purposes. We suggest that you browse our collection of troughs and also discuss your needs with us. This way, we can guide you in the right direction and even customize the dimensions of the troughs to suit your requirements.